How Can the EAEU Produce a Better Economic Effect? The treaty establishing the EAEU marks its fifth anniversary in 2019. 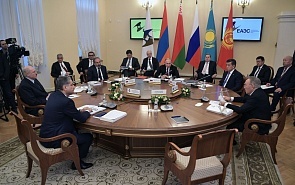 The Eurasian Intergovernmental Council held its first meeting of the year in Almaty, bringing together the prime ministers of Belarus, Kazakhstan, Kyrgyzstan and Russia, as well as the deputy prime minister of Armenia and the chairman of the board of the Eurasian Economic Commission. The participants discussed economic cooperation formats and ways to further step up trade among EAEU member countries by harmonizing laws on trade, taxes, logistics and transportation. One thing to take into consideration is that the countries joined the EAEU at different times and on different terms, with some benefiting from transition periods and various temporary exemptions. It takes time to harmonize laws and interests. In particular, the five countries are proactive in their efforts to devise a single policy for alcohol and tobacco excise duties, as well as a single legal framework for navigation in inland EAEU waters. At the current stage in its development, the EAEU is focusing on its so-called digital agenda, which means introducing digital technology in trade and manufacturing, and promoting digital cooperation in all EAEU countries. At the end of the day, all these efforts are designed to bring about a single legal framework facilitating access to the economies of EAEU member countries and achieving the main purpose of the EAEU, which is to maximize economic benefits from cooperation. The Eurasian Economic Union can be hardly compared to other integration initiatives due to its specific structure, since one EAEU member country is larger than the other members taken together in terms of territory, population and GDP. Not only is Russia bigger and more powerful, but it also enjoys a different status as a nuclear power and permanent member of the UN Security Council. In addition, it is also the former metropole with regard to other EAEU members. There are countries that dominate in other unions. For example, Germany is the largest European economy and the driver of European integration. However, the EU also includes a number of other major powers, including France, Italy and Great Britain, at least for now. In any case, there is no country within the EU that has a similar weight in terms of size and power, compared to Russia in the EAEU. On the one hand, this specific feature can be viewed as an advantage. It can be argued that EAEU countries inherited their potential for integration and unification from the USSR, especially if the metropole plays a central role. On the other hand, the EAEU is like a rimless wheel: there is nothing to connect the rods radiating from the wheel’s center. It is the relations with Russia, its market, economic potential and geography that matter for every EAEU country. Otherwise, these countries have little appetite for interacting with one another. What could make Belarus interested in Armenia or Armenia in Kyrgyzstan? This has to be taken into consideration, including efforts to offset any fears member countries may have. Ideally, the EAEU could use its specific nature to its advantage. This calls for programs to promote integration across the EAEU, and Russia is the only country that can finance initiatives of this kind. Given the current lack of long-term and low-rate borrowing, the declining oil prices, and Western sanctions against Russia, it would be hard for Russia to attract investors even when these projects promise hefty returns. For example, simply creating a system for electronic processing of shipping documents across the EAEU can bring billions of dollars in returns. However, so far the prospects of programs of this kind materializing are not clear, since the EAEU sets its agenda and goals as it goes along, just as was the case at the Almaty meeting. The next meeting of the Eurasian Intergovernmental Council will take place in Yerevan in late spring.